The Wisconsin Frog and Toad Survey (WFTS) includes approximately 100 permanent roadside routes throughout the state where volunteers monitor frog populations through calling surveys. Each route consists of 10 listening stations within hearing distance of wetlands that represent the range of local anuran breeding habitats such as ephemeral ponds, lakes, meadows, marshes, and wooded swamps. 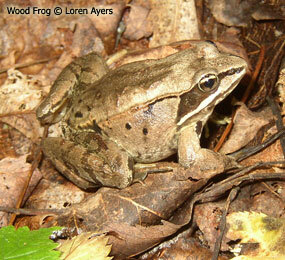 Stations are located far enough apart that individual frogs cannot be heard from more than one station. Depending on local topography and vegetation, inter-site distances can be as close as 0.5 miles, but may be up to 2.0 miles. Individuals can be counted; there is space between calls (no overlapping of calls). Calls of individuals can be distinguished but there is some overlapping of calls. Full chorus. Calls are constant, continuous, and overlapping; individual calls can not be distinguished. Water temperatures are recorded where feasible, and where they appear to represent the conditions in which frogs are breeding. Air temperature, wind speed (Beaufort scale), and sky condition are recorded at the beginning and end of each route. Volunteers are asked to comment on changes in wetland conditions, problems with background noise, etc., and are encouraged to take along at least one other reliable observer who can run the survey alone if the primary observer is unable to do so at any time.